​We need YOUR voice! Join us Downtown May 4th. We first heard about TOPA (Tenant Opportunity to Purchase Act) last year at the Bay Area Community Land Trust convening. We immediately started working to see how Sacramento could implement a similar program. We are thrilled to see San Francisco taking a giant step toward protecting housing affordability. Supervisor Sandra Lee Fewer introduced legislation in December 2018 to establish the Community Opportunity to Purchase Act (COPA). COPA is an innovative policy designed to stabilize communities by preventing displacement and preserving affordable housing. The Community Opportunity to Purchase Act would apply to the sale of non-condo residential building of 3 or more units. It would give qualified nonprofits a first-right-to-purchase—consisting of both a right of first offer and a right of first refusal—over multi-family residential buildings (and related construction sites and vacant lots), for the purpose of creating and preserving permanently affordable housing. Applicants would have to be prequalified by the City as bona-fide nonprofits with a mission to create permanently affordable housing for low- and moderate-income residents, and a demonstrated capacity to effectively acquire and manage residential property at multiple locations in San Francisco. The legislation would require sellers to notify the qualified pool of nonprofit organizations of their intent to sell. Potential nonprofit buyers would have a limited time (25 days) to work with tenants and exercise their first right of offer and, if accepted by the seller, enter into a Purchase-Sale Agreement. While a seller is not required to accept the offer, the qualified nonprofit would also be given a right of first refusal to match a competing offer. A sale would be defined to include partial transfers within LLCs. At closing, deed restrictions would be placed on the building, restricting the building to affordable housing "for the life of the building," with a mean value of all rents paid in the building not to exceed 80% of Area Median Income. 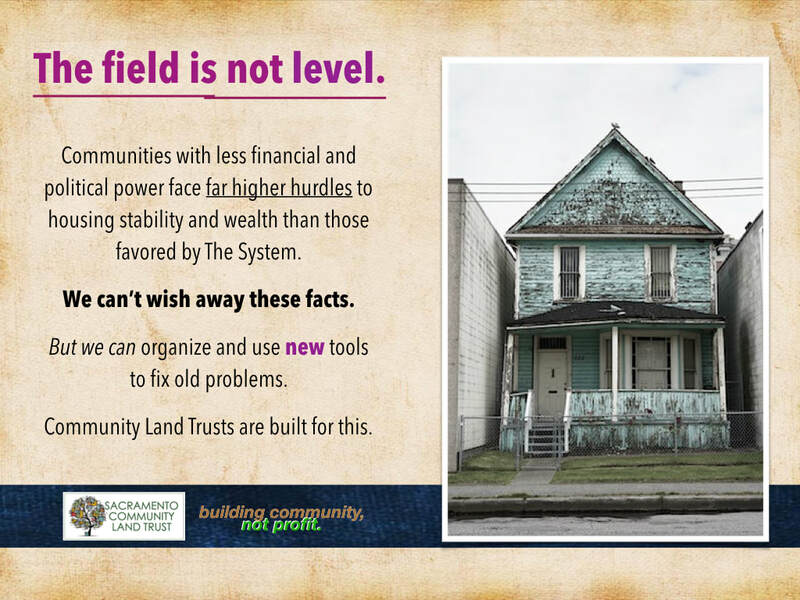 Sacramento Community Land Trust prevents displacement and builds historically discriminated neighborhood power to combat deterioration and market speculation by fostering equitable development for generations to come.